What is Asylum, and Who Can Claim It? Home/Immigration/What is Asylum, and Who Can Claim It? Every year, according to the American Immigration Council, thousands of people who aren’t US citizens apply for asylum in the United States. Asylum is a form of protection from prosecution. The process to obtain asylum is very complicated, and normally requires the assistance of experienced immigration lawyers. If someone is granted asylum, he or she can then apply to live in the United States on a permanent basis. He or she can also apply for specifically approved government benefits. Once the asylum application is approved, applicants can work in the US, can seek to obtain a Social Security card, can request approval to travel overseas, and can “petition to bring family members” to America. They can also request Refugee Medicaid Assistance or Medicaid. A year after their application for asylum is approved, they can request a green card (the right to permanent residential status). Four years after obtaining their green card, they can apply for U.S. citizenship. Affirmative asylum. This process is for applicants who are not in removal proceedings. The applicant applies through USCIS (the U.S. Citizenship and Immigration Services). If the asylum request is denied by the USCIS asylum officer and the applicant doesn’t have any other lawful immigration status in the United States, the asylum seeker will be forced to go through removal proceedings. At the removal proceeding, the applicant can seek asylum through the defensive asylum process. Defensive asylum. This process is generally used by asylum seekers who are in removal proceedings – usually because they arrived at a U.S. Port of entry or because they entered America without inspection. 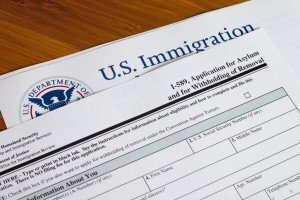 The applicant files the asylum request with the Executive Office for Immigration Review (EOIR). The Department of Justice oversees the EOIR. The applicant can hire an attorney but an attorney will not be appointed for him/her. The applicant must be physically in America to file for either type of asylum. The applicant must show he/she qualifies as a refugee in both types of asylum processes. In many cases, the key evidence is the applicant’s own testimony. Testimony from other witnesses and physical evidence can be very helpful. There are strict time limits for apply for asylum. Asylum seekers who the US deems are a danger to the country cannot seek asylum. There are many practical and legal issues involved with seeking either affirmative or defensive asylum. There are key legal terms such as “credible fear” and “reasonable fear” that can mean the difference between approval and denial of asylum status. At LaFevor & Slaughter, we have been fighting for immigrants for nearly 40 years. Our Knoxville immigration lawyers are ready to move quickly when your right to stay in the US is being contested in any way. For immediate help with any immigration issue, call us at 865.272.4454 or fill out our contact form to schedule a free appointment. How Long Can Undocumented Immigrant Families Expect to Live in Detention Centers?